About 100 people attended the farewell ceremony yesterday as the double-masted ship Carthaginian went down off Maui. LAHAINA, Maui » With hula dancers swaying to "Aloha Oe," about 100 people bid farewell to a Lahaina landmark that served as a floating whaling museum for more than 20 years. The aging and rusted Carthaginian, a replica of a double-masted brigantine, was towed from its dock in Lahaina Harbor yesterday morning and sunk to create an artificial reef and visitor diving attraction. 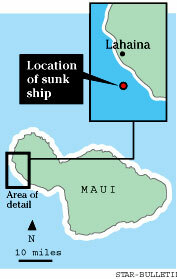 The ship is now about a half-mile offshore, between Puamana and Launiupoko beach parks. "It's time. Everything moves along," said George Allan, an artist who rode as a crew member on the Carthaginian in 1973, bringing it from Sweden to Maui. "I just hope they got something new, something appropriate." Allan and other members of the Lahaina Restoration Foundation, who formerly operated the floating museum, hope a proposal to put a Hawaiian voyaging canoe in the Carthaginian's berth is successful. Foundation Executive Director George "Keoki" Freeland said nothing has been signed, but talks are progressing with the nonprofit group Hui O Wa'a Kaulua to put its 42-foot Hawaiian double-hulled canoe Mo'olelo in the place once occupied by the Carthaginian. Hui President Ke'eaumoku Kapu said after relashing the body and repairing the vessel's sails, his group will be ready to berth the Mo'olelo at Lahaina Harbor. Some residents had mixed feelings about the demise of the Carthaginian, a visitor attraction for more than a quarter of a century. Artist Peg Robertson said that in a matter of days, she saw more than 50 people take photographs of the ship and she raised questions about the kind of replacement the foundation could find for the berth. Washington state visitors Ray and Phyllis Davids recalled how foundation officials and volunteers worked feverishly to save the Carthaginian during Hurricane Iniki in 1992. "Now, they're going to sink it," Ray Davids said. Foundation officials, who sold the vessel two years ago to Atlantis Adventures, said the steel-hulled Carthaginian, built in 1921 and once used as a cement carrier in the Baltic, was beyond repair and could have created a navigation hazard. Freeland said he was relieved that the vessel was sunk. "We were very concerned it would sink where it was moored," he said. Freeland said the ship, converted into a two-masted brig and serving as a floating museum since 1976, was used to replace a twin-masted replica of an 1840s brig used for the film "Hawaii." The movie brig sank off Lahaina while on its way to dry dock on Oahu in 1972. Atlantis Submarines, which conducts tours aboard its submersible vessels, spent an estimated $300,000 to $350,000 to prepare the Carthaginian for sinking, including the cleaning of the vessel to make sure it did not create an environmental hazard. 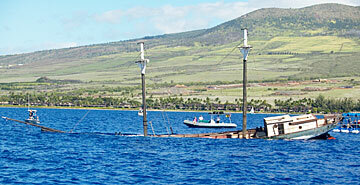 The company has created a similar artificial reef made of sunken vessels off Waikiki. "The improvement is tremendous. The marine life is abundant," Atlantis President Ron Williams said. Atlantis contracted American Marine to sink the ship by pumping sea water into it and removing square wooden boards covering pre-cut holes in the hull to allow flooding. Once at the location, the vessel took a little more than 27 minutes to sink, with the bow going under first. "She went down beautifully ... with the dignity she deserved," said foundation President Mary Helen Lindsey. "We're sure going to miss her."